Consumers are no doubt familiar with the trials Napa, Mendocino and Sonoma Counties have faced over the past week, and have seen news that showcases the impact the recent fires have had on some of the area’s beautiful terrain. They’ve also likely seen the selflessness of the first responders who fought tirelessly to keep Sonoma Valley safe from the flames, and whose perseverance assured that none of the region’s stunning wineries, hotels and restaurants were destroyed or left inoperable. None of Sonoma Valley’s 100+ wineries – 85 percent of which are family owned – were destroyed during the fire. As such, tasting rooms have reopened, and are ready to indulge visitors with some of the nation’s most acclaimed and delicious wine. The eight-acre Sonoma Plaza, a National Historic Landmark, will celebrate its annual lighting ceremony on November 18. Marking the start of the holiday season, the plaza will glow every night with more than 150,000 holiday lights, strung across eight acres. The picturesque, historic site was laid out by General Mariano Vallejo in 1835 and the largest plaza of its kind in California. Perusing the small shops that line the plaza amidst a ceiling of sparkling lights creates a uniquely memorable experience. 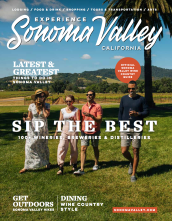 As the temperatures get a bit cooler, Sonoma Valley is entering shoulder season, which means visitors will enjoy competitive lodging rates and all of the attractions Sonoma is known for, without waits at restaurants or wineries that often occur during high season. Visitors can meet all of the heroes who helped save Sonoma Valley from the fires, including the furry ones such as Odin the Pyrenese Mountain Dog who saved a herd of goats and two feral baby deer, as well as the animals – from bobcats and tigers to antelope and zebras – who made it safely through the fires and call Safari West, a wildlife preserve and African tent camp, home. Many of the valley’s local restaurants, hotels and tour operators will donate a percentage of revenue to relief funds; visitors are encouraged to come sleep, eat and explore, knowing that their good times will support good causes!